In 1866, a gang of four goldfield criminals murdered five men (and their horse) on the Maungatapu track near Nelson. The subsequent search for the bodies, trial, and execution of some of the murderers seized the attention of the nation. Newspapers were full of the events for weeks and even years afterwards. 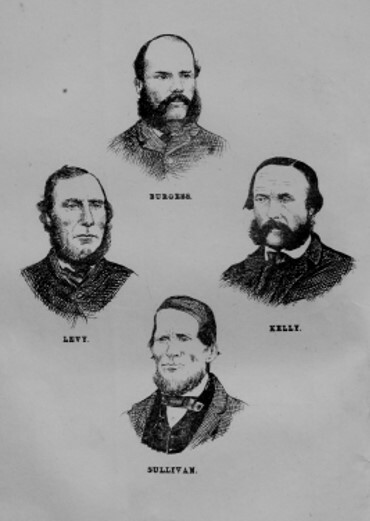 The accused men were labelled ‘The Burgess Gang’: Richard Burgess, Joseph Sullivan, Philip Levy, and Thomas Kelly. Photos of Burgess, Levy, Kelly, and Sullivan taken during the trial (from “A full history of the Maungatapu murders: including a narrative of the events preceding the murders, confessions of Sullivan & Burgess, a corrected report of the trial, detailed particulars of the execution of Burgess, Kelly and Levy, and lives of the murderers, with portraits, and plans and sections of the road”. Nelson: 1866). Burgess and Kelly were both transported convicts, who had lived a life of crime on the Australian goldfields and been in and out of gaol there, until following the gold to Otago in 1862. They served three years in gaol in Dunedin for theft and attempted murder, before travelling to the West Coast and forming a new gang there with Sullivan and a former acquaintance, Levy. In the course of numerous robberies and assaults on the West Coast goldfields, Levy heard talk of a party of businessmen planning to travel from Canvastown to Nelson to deposit their earnings in the bank. Excited by the rumour that the businessmen would be carrying up to £1000, the gang made a plan to rob them. On June 12, 1866, they positioned themselves on the track, by what would later become known as Murders Rock. A flax grower in his fifties, James Battle, travelling along the track, was stopped by the gang and initially they let him pass. They later decided that he may be able to identify them, and some of the gang chased him down and killed him, robbing him of his wages of £3.17s. 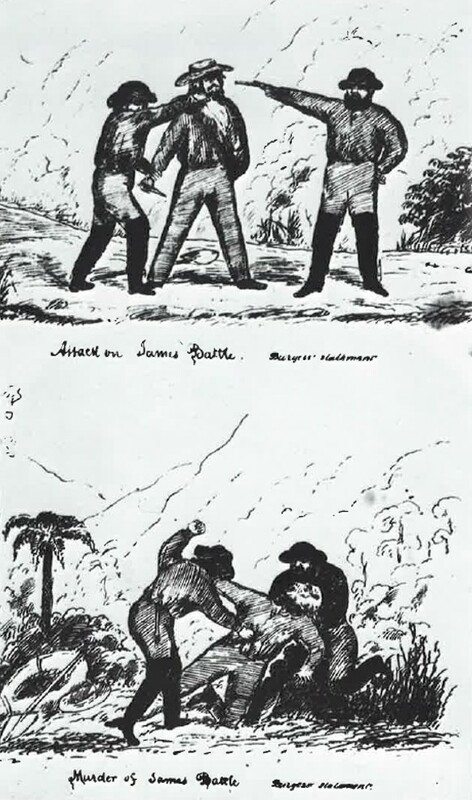 The attack on and murder of James Battle (as reproduced in Hill, Richard, Policing the Colonial Frontier: the theory and practice of coercive social and racial control in New Zealand, 1767-1867. Wellington: Historical Publications Branch Dept of Internal Affairs, 1986). On June 13, the party of four businessmen – George Dudley, James de Pontius, Felix Mathieu, and John Kempthorne, and their horse – named Old Farmer – were held up, robbed, and murdered by the Burgess Gang. They burned the men’s’ clothes and other evidence, and hid three of the bodies, leaving the fourth in a manner intended to suggest he was the culprit, if the bodies were ever found. The gang then returned to Nelson, to spend their ill-gotten gains of just over £16 each, nowhere near the amount that they had hoped for. 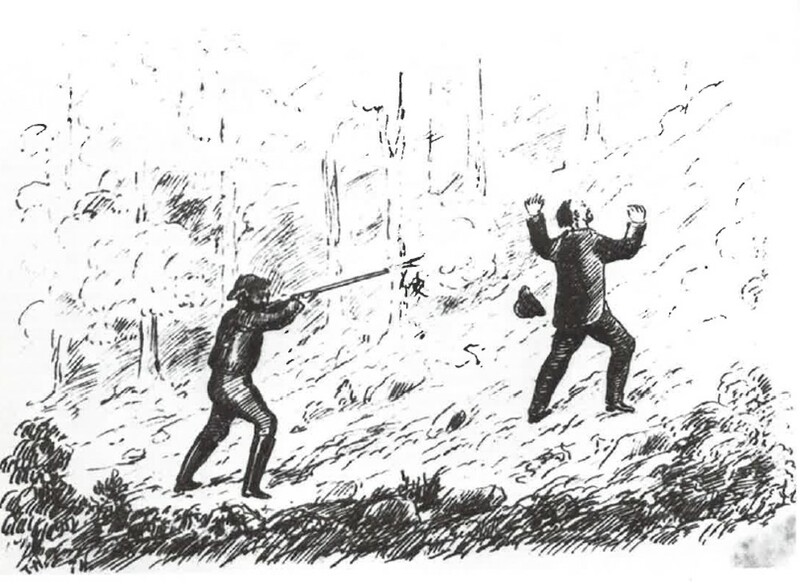 Caption: Burgess shoots Kempthorne on Maungatapu Mountain (as reproduced in Byron, Ken. ‘Guilty wretch that I am’: echoes of Australian Bushrangers from the death row memoirs of Richard Burgess. South Melbourne: Macmillan, 1984). In Nelson, a friend of the businessmen was waiting for their arrival in order to take Old Farmer back to Canvastown. When the party did not arrive, he raised the alarm. Police began to investigate the matter on June 18. Suspicion fell quickly on the Burgess Gang, who had been seen by a number of witnesses heading in the direction of the Maungatapu track, and had been spending money in Nelson over the last few days. The four men were arrested on June 18 and 19. The citizens of Nelson were horrified by the apparent crime, and a large search party was formed, finding Old Farmer’s body and a gun on June 20. While the search continued in the difficult terrain, Sullivan took advantage of an offer from the Governor of a pardon to any accomplice to the murders who gave information resulting in a conviction of the murderer(s). He gave a full confession, implicating his three partners in crime (but not himself), and directing police to the bodies, which were found on June 29. Sullivan also later disclosed to the police the location of James Battle’s body, as his disappearance had gone unreported. This monument was erected by public subscription in memory of five late residents of the province of Marlborough who are interred here. They were waylaid, robbed, and barbarously murdered by a gang of four bushrangers, on the Maungatapu Mountain, in this province, June 12 and 13 1866 / Avenge not yourselves, but rather give place unto wrath for it is written. Vengeance is mine: I will repay saith the Lord. Romans XII 19. While in gaol awaiting trial, Burgess wrote a now infamous confession/autobiography that contradicted Sullivan’s confession, and claimed that Levy and Kelly were innocent of the actual murders. Burgess’ confession is long and written in an attractive literary style, and is considered a classic of crime writing. The trial ran from September 12-18. Despite Burgess’ counter-confession, Burgess, Levy, and Kelly were found guilty and sentenced to death by hanging. They were executed at a specially-constructed gallows on October 5. Levy went to his death protesting his innocence. Sullivan was tried for and found guilty of the murder of James Battle. He was sentenced to death, which was later downgraded to life imprisonment. He was sent to Dunedin gaol for a time, and then released on the condition he left New Zealand. After some time in England, he travelled to Australia where he was arrested by Australian authorities while trying to make contact with his wife and family. It seems he may have been relocated by the government, and then passed into legend somewhat with no confirmed sightings after this time. The pre-meditation and cold brutality of the murders, and especially the controversy of the competing confessions, seized the imagination and fired the indignation of the New Zealand public. Newspapers at the time were full of the story, following every twist and turn in the search and the trial. A ‘grand moving diorama of the Maungatapu murders, occupying 2000 feet of canvas’ was touring the country by November 1866. The local Nelson paper, the Examiner, printed a booklet covering the details of the case and the trial, and providing much desired detail about the chequered pasts of the accused. An original 1866 copy of this booklet, with maps and photos, was bound with other pamphlets by Justice H.S. Chapman and gifted to the Hocken. In the back of this pamphlet are secured three letters: one from Burgess to Mr Adams, a prosecutor; one from Sullivan to Mr Sharpe, a Nelson Court registrar; and one from Levy and Kelly to Sergeant-Major Shallcrass, a police officer who was involved with the case. The letters highlight how important the finer details of the case were in determining whose account was correct: Burgess or Sullivan. I forgot to mention in my previous requests for your official aid and furtherance one item of importance, to the carrying out of justice to all concerned, so I have taken the liberty of again intruding myself on you, to see that my application to you is attended too, it is this. If you remember Sullivan stated, the balls we had with us, and some of which were drawn from the gun he threw away, were stolen from the Grey[? ], no such thing, they were purchased. Now I wish that you Telegraph, the authorities at the Grey, and cause them to make inquiry at Mr Helier’s shooting gallery, next door the Star Hotel, whether he remembers the night of Friday, the first of June, selling five shillings worth of balls to anyone, on the same night, the ramrod was [?]. With this being sent through the Government it will be sufficient proof, without issuing subpoenas for their attendance, note the address Mr Eli Helier next the Star Hotel. I would thank you if you would have a Summons served upon the Witness Harvey to attend in the case of James Battle. For in Burgess’ confession he says that Kelly & Levey left us at the Bridge to proceed into Nelson Mr Galloway can prove that there men Harveys party where but a short distance ahead of us. My statement is this that at the time Burgess & Levey where securing the man Battle there was a gun discharged and I went up the road and I heard the Report of another gun and then I observed three men upon the road near Franklyn’s Flat. If I could see these men where was Kelly and Levey at this time for by the statement Burgess has made they left us at the Bridge and it appears that Harveys Party never seen them upon the road. Suppose they must have hid themselves upon this occasion as Burgess states they did on the following day. If it is Convenient to would thank you for the Different Distances of the road that bears upon my case. Sir this if to inform you that it is Our wish, as we are going to be tried for Our innocent lives, that if the laws of Our Country allows us to be tried by a Special Jury, by making application that you will Please to grant Our request, and your humble servants will for Ever Pray. The 1866 pamphlet was revised and reprinted many times due to ongoing interest in the case. The Hocken holds issues of The Maungatapu Mountain Murders from 1890 (a Hocken original), 1909, and 1924. Also in 1866, the murders were the inspiration for a sermon delivered by the Bishop of Wellington on ‘Ahab’s crimes and the Maungatapu Murders, treated on the principles of the new school of morals and religion.’ The Bishop reflects on how he would deal with communities rife with criminal behaviours such as those on the West Coast, and what message the Gospel truly brings regarding criminality. An interesting additional layer to the case, the Hocken holds a photocopy of ‘Practical phrenology: a lecture on the heads, casts of the heads, and characters of the Maungatapu murderers, Levy, Kelly, Sullivan, and Burgess’ by A.S. Hamilton; delivered in the Provincial Hall, Nelson, for the benefit of the Maungatapu Monument Fund, October 8, 1866. From Hamilton, A. S. Practical phrenology: a lecture on the heads, casts of the heads, and characters of the Maungatapu murderers, Levy, Kelly, Sullivan, and Burgess. Nelson: 1866). More modern authors continue to be intrigued by these events, and the Hocken holds a number of interesting sources. Clune, Frank. 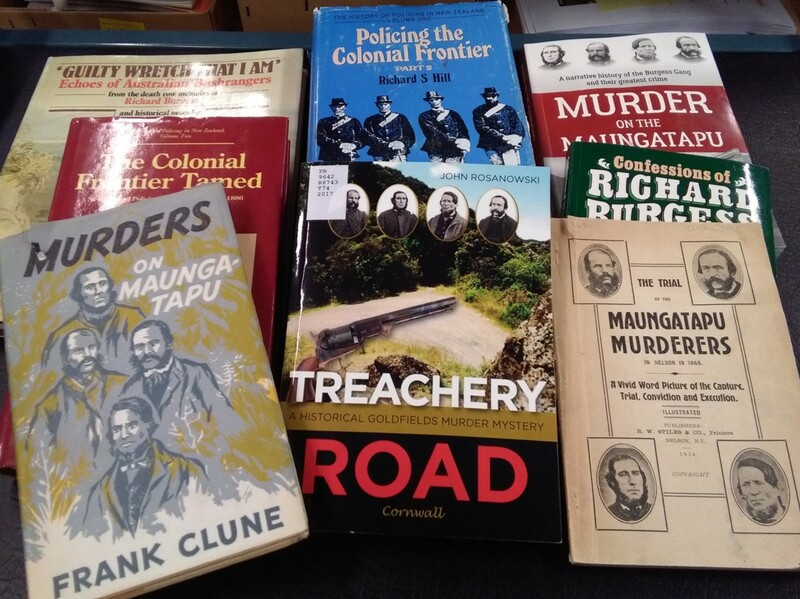 Murders on Maunga-tapu. Sydney: Angus & Robertson, 1959. Clune wrote historical novels, travel books, and histories of scandalous events in early NZ and Australia. This work provides a “grim account of a callous crime committed on the New Zealand goldfields in 1866… [and] an unusual study of the mental make-up of the four lying brutal Londoners who were responsible for the crime…”. Burton, David, ed. Confessions of Richard Burgess: the Maungatapu murders and other grisly crimes. Wellington: Reed, 1983. Burton gives an account of the murders, as well as a transcript of Burgess’ famous confession. Byron, Ken. ‘Guilty wretch that I am’: echoes of Australian Bushrangers from the death row memoirs of Richard Burgess. South Melbourne: Macmillan, 1984. Byron looks at Burgess’ confession in the context of the bushrangers and his criminal upbringing. Hawes, Peter. Outlaws and Rogues. Auckland: Whitcoulls, 2003. In this illustrated book for tweenagers, the Maungatapu murderers take their place beside other notorious rogues in history, such as Billy the Kid and Al Capone. Martin, Wayne. Murder on the Maungatapu: a narrative history of the Burgess Gang and their greatest Christchurch: Canterbury University Press, 2016. Martin re-examines the case with new eyes, using little-known primary sources, and suggests an alternative narrative. Rosanowski, John. Treachery Road: a historical goldfields murder mystery. Christchurch: Cornwall, 2017. Rosanowski approaches the case as a journalist in the 1890s reinvestigating the murders. He claims to have uncovered new information about Sullivan which suggests Kelly and Levy were innocent, as Burgess claimed. Some of the Hocken Collections’ resources on the Maungatapu murders. The fascination with this case has continued in other formats as well. In 1972, a radio play ‘Death at Murderers Rock’ was produced by the Overseas Programme Exchange Service. In 2016, the Nelson Provincial Museum put on a two-part exhibition about the murders and the trial. A play about the murders, by Nelson playwright Justin Eade, was performed in the Nelson/Marlborough area and later at the Arts Market in Wellington in 2016/2017. In 2017, Burgess’ story was included in the ‘Black Sheep’ podcast. If you wish to view any of the books referenced above, or any of the Hocken Collections’ other fascinating resources, the staff here at 90 Anzac Avenue are more than happy to help. Visit us between 10am and 5pm, Monday – Saturday. Please bring photo ID with you to register as a reader. Burgess had earned something of a name for himself in Dunedin’s gaol: ‘Early in 1863, Burgess once or twice caused great danger in the Dunedin gaol. Once, he contrived to communicate with the notorious Garrett and others, so as to concert a breaking out; and he contrived to break through a thick stone wall and enter the adjoining cell. On another occasion, he and Garrett each barricaded the door of his cell, and set the officers at defiance until the doors had been battered down. Those doors, and the others in the gaol, then opened inwards – a stupid arrangement, which was speedily altered. Burgess was flogged, and he bore his punishment with seeming indifference.’ Otago Daily Times (Dunedin, New Zealand), quoted in “A full history of the Maungatapu murders: including a narrative of the events preceding the murders, confessions of Sullivan & Burgess, a corrected report of the trial, detailed particulars of the execution of Burgess, Kelly and Levy, and lives of the murderers, with portraits, and plans and sections of the road” (Nelson: 1866), 15. Ken Byron, ‘Guilty wretch that I am’: echoes of Australian Bushrangers from the death row memoirs of Richard Burgess (South Melbourne: Macmillan, 1984), 98. The men were strangled, stabbed, and shot. For a comprehensive account of the attacks, see Wayne Martin, Murder on the Maungatapu: a narrative history of the Burgess Gang and their greatest crime (Christchurch: Canterbury University Press, 2016), 131. For the poster stating the conditions of the offer of immunity, see Martin, xix. Mark Twain described Burgess’ confession as: ‘…a remarkable paper. For brevity, succinctness, and concentration, it is perhaps without its peer in the literature of murder. There are no waste words in it; there is no obtrusion of matter not pertinent to the occasion, nor any departure from the dispassionate tone proper to a formal business statement—for that is what it is: a business statement of a murder, by the chief engineer of it, or superintendent, or foreman, or whatever one may prefer to call him.’ Mark Twain, Following the Equator: A Journey Around the World (1897), ch.XXXIII. A quick search of Papers Past reveals dozens of articles about the investigation, the trial, and the execution, and the backgrounds of the criminals. Even in 1935, an obituary for Alfred Mills references that he was in Nelson at the time of the Maungatapu murders. Otago Daily Times, 10 October 1935, 9. Otago Daily Times, 2 November 1866, 1. Admission was 1s. “A full history of the Maungatapu murders” is bound with Chapman Pamphlets v.14, no.13. This pamphlet is bound in Hocken Pamphlets v.79. 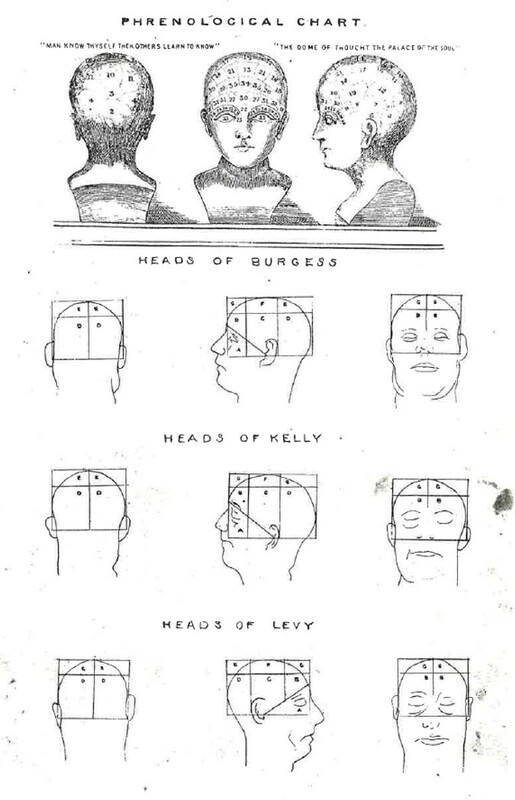 A.S. Hamilton, “Practical phrenology: a lecture on the heads, casts of the heads, and characters of the Maungatapu murderers, Levy, Kelly, Sullivan, and Burgess” (Nelson: 1866), 4. This entry was posted in Books, Crime and criminals, Research by Hocken Collections. Bookmark the permalink.